There aren’t many hotels that take my breath away; or that I can honestly say are flawless, or that I just want to return to again and again. That was until I stayed at the insanely good, Beaverbrook. Set in 400 acres of historic countryside in the Surrey Hills, this hotel is simply, outstanding! On a rainy Saturday in December, as my sister and I drove through the grand gates of this Countryside hotel, we approached a small gatehouse where a smart, switched-on young man efficiently directed us to the main house, where we were lucky enough to be staying. There are two buildings for rooms, the main house (Beaverbrook) and The Garden House. Upon arrival to the swish entrance, with some beautiful sports cars parked outside, we were greeted by the porters who swiftly unpacked our bags, took my car keys and ushered us out of the torrential rain, into the main house. Instantly I felt, like the week’s stresses were a distant memory, and that I was about to embark on one of the best hotel experiences I’d ever had, and how right I was! The hotel itself, is named after its best-known former resident Lord Beaverbrook – the publicist, political powerhouse and close friend of none other than Winston Churchill. History tells us, that Lord Beaverbrook’s infamous parties drew the high society celebrity of the thirties through to the sixties, and their presence very much continues today. 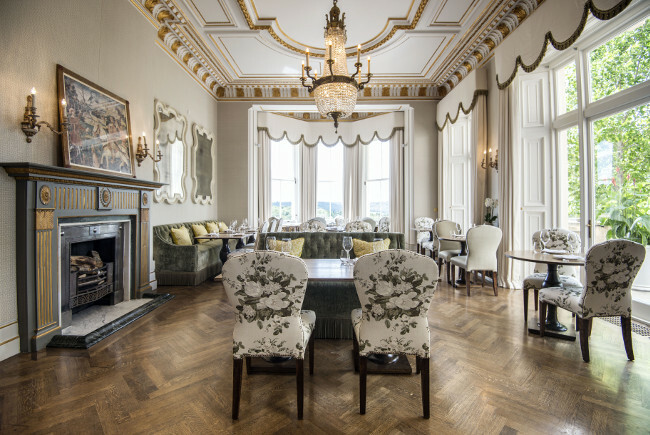 Beaverbrook recently had a £12million makeover – with the interior designed by none other than the fantastic, Susie Atkinson. Susie’s CV includes the interiors for some of the Soho House groups houses across the Globe. And although Beaverbrook is entirely different, it still has a sense of what I love about Soho House’s décor. It’s relaxed, timeless, yet on trend without being too overbearing or intimidating. There is something about Susie’s work that I just adore. She includes detail in ways you and I wouldn’t ever think of. From clashing prints, to using every nook and cranny, to a mix of texture, she just gets it spot on. Desperate for a nosey around, my sister and I had a little tour by the hotel Director Andrew Spearman, who was so kind and welcoming. I hate five star hotels that are intimidating and where you can’t move an inch without someone greeting you in some shape or form. But Andrew was both informative, and warm – perfect! 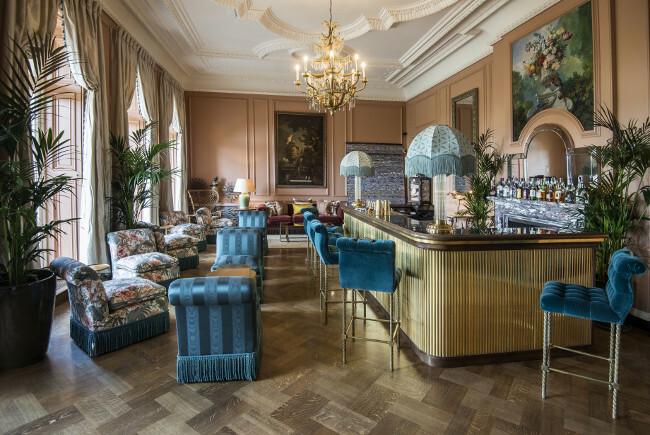 After a brief look in the drawing room, and main restaurant – we went into The Parrot Bar – which for me, is the ultimate showstopper of this World class hotel, and worth a visit to the hotel in itself!! The Parrot Bar feels as though you’re being transported back to a society party in the twenties, from the velvet chairs to gold and navy tones, I wanted to don a flapper dress and gloves and pretend I was part of that era!! I don’t think there’s a hotel in the UK with a bar like it, it really is THAT good. Nothing about it was ‘fuddy duddy’ and would be the number one hangout if it were anywhere in the city. After a brief drink, we had lunch in The Garden House, a short walk from the main house, or, as it was torrential rain, a short journey on a golf buggy, thanks to the staff who guessed, we may not fancy the walk in the rain. The setting for The Garden House is again, superb. 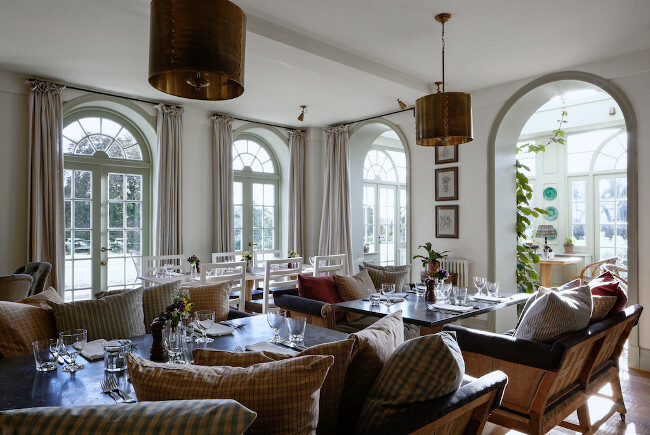 Country chic is the best description I can give, with the right balance of tables to make it busy, yet cosy….and then there’s the food! Being a seasonal menu, it’s forever being adapted, but as this was December, I started with the carpaccio, followed by the wild mushroom and celeriac risotto. Whilst my sister had king prawns to start, followed by a fish pasta dish. After a very fulfilling lunch, we checked into our Suite. 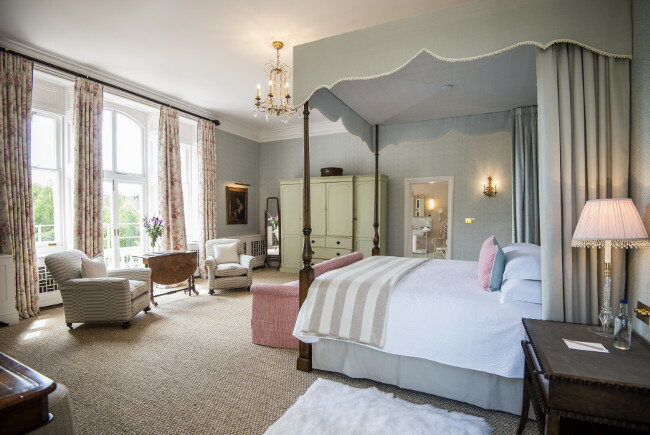 We stayed in the Lady Diana Cooper room, which boasted a four-poster bed, a roll top bath that looked over the Surrey Hills, a pink pouffe I genuinely want to buy, and everything in-between. We couldn’t help but squeal in excitement at the sheer magnificence of it. In a strange way, we were actually pleased it was raining, as it meant we could spend the rest of the afternoon relaxing in our room, drinking a bottle of champagne that comes complementary with every room (I told you the benefits of this hotel were endless didn’t I)! The staff at Beaverbrook are utterly exceptional, on the right side of attentive, they make you feel at home, and welcome. Even their uniforms are slick, cool and smart. Each member of staff is switched on, only too happy to help and just seem happy to work there (admittedly I would be too)! Before dinner, we headed for a cocktail in The Parrot bar, which by this time was buzzing – everyone was glamourous and the barmen – fantastic. If it hadn’t have been for our dinner reservation, I would have sat there all night! For dinner, we headed to the main dining room, with current head chef Taiji Maruyama, formally of Nobu. I LOVE sushi and Japanese food. If I could, I’d eat it every day. However, I’m first to admit that I’m no expert when it comes to ordering. Yet, despite the restaurant being fine dining, our waitress, was friendly, helpful and didn’t make us feel in the slightest bit intimidated for not knowing what all of the dishes were. She suggested dishes for us, which we happily accepted. We shared edamame, sushi tacos, popcorn tempura (which we could have ate five times over, it was so good) and a spinach salad (the dressing of which is making me salivate writing this) to start with. 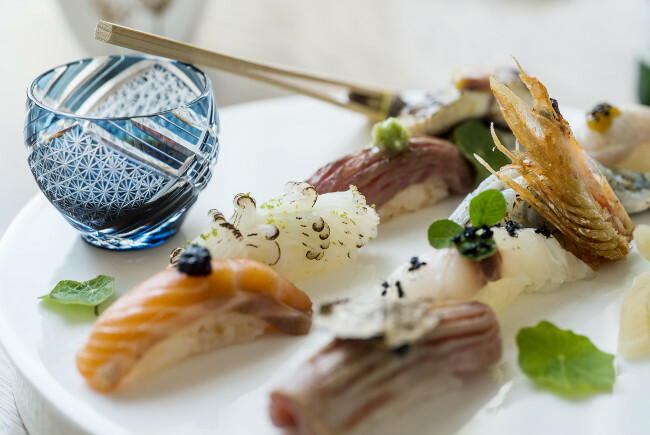 Followed by sushami and the Beaverbrook Omakase Nigri (the chef’s selection of individually garnished nigari) which offers the best of the fresh fish that day – I mean come on!! Being the mum of a toddler, it was SO amazing for someone to think for me for a change. After a beautiful dinner with a stunning glass of wine, we retired to our amazing room, and into the comfiest of hotel beds. The following morning, we had breakfast – which needless to say was amazing, and then we toured the hotel grounds to walk off the weekend’s indulgence. Now, if you have kids, which we both do, then you HAVE to visit with them. There is the world’ coolest play-area, where, if there hadn’t been kids in there playing, I myself would have ran around in! It’s what dreams are made of, not to mention there’s a crèche should you wish some chill out time with your other half. Beaverbrook, has officially stolen my heart forever, and with the newly opened spa boasting both indoor and outdoor pools it means I must visit again; but maybe this time with my husband in tow. For anyone needing a country escape, there is no better place in my eyes, than Beaverbrook.